A traditional village in every sense, Banavasi has a diversity of artisans involved in artistic carpentry, sandalwood carving, basket making, pottery, black smithy, shoe-mending, and rangoli. 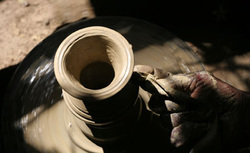 The Gudigar community at Banavasi is comprised of versatile artisans. Art is in their veins and has flowed as a tradition from one generation to the next. They carve, sculpt, paint and mould using different mediums. They excel when it comes to sandal and teak wood carving. Beside Gudigars, there are many skilled crafts persons like carpenters, potters, rangoli artists, pith coronet carver, yakshagana mask makers, etc. who excel in their craft. The craft shop in the Tourist Complex gives you an introduction to these crafts persons and their crafts. A walk around Banavasi will help you to understand the crafts better and if you have the time, learn a bit of the craft itself. There is also a bag-making unit set up by a group of women. They make the bags out of silk saris and embellish the fabric with mirrors, embroidery and tassels.